I have been enjoying this warm sunny Saturday...and I just finished a wonderful lunch with my BFF. She comes into the city every Saturday to train for a marathon, and after several weeks of not being able to meet up, we finally had a chat-fest over lunch. I wanted to make a cool summer appetizer and settled on one of my favorite chaats or Indian street foods- Dahi Vada or lentil balls in yogurt. Soak 1 cup urad dal in warm water for 4-8 hours. Drain and process the dal in a food processor or blender to make a thick smooth batter. Add 1/2 tsp of salt and 2 finely chopped chillies to the batter and mix. Drop teaspoonfuls of batter into hot oil and deep fry to make golden-brown vadas. After frying, drop the vadas gently into a bowl of warm water. After soaking for a few minutes, remove each vada, press it between your palms to squeeze out excess water and then refrigerate them to chill. 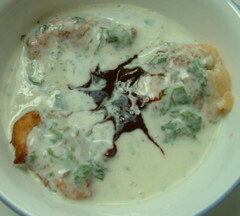 To serve: Simply place the vadas in a bowl and pour yogurt sauce on top. Add a spoonful of sweet chutney (such as tamarind or date chutney) and enjoy a tangy chaat. In many ways it is a perfect appetizer- it can be made in advance, chilled and needs no re-heating. It is not much to look at, but it tastes great. Dahi Vadas look great Nupur, perfect on hot Sunny day. Did you use fresh coconut for avial? I am just wondering because coconut quality makes all the difference in avial. You are right, the frozen coconut that I used probably made the avial taste less than great! hi nupur, its great eating only the fried vadas too ,so you can enjoy two in one, both meduvadas and dahi vadas. Hi Yoma, I usually do make both madu vadas and dahi vadas together but that day it was just too hot to eat medu vadas by themselves. Glad it worked out...we both have to thank Lydia for the recipe! nupur. you are tarla dalal of west. i guess. I'd like to try out your Dahi vada recipe, but what I was wondering is why do you put the vadas in warm water after frying? Does this help in soaking the yoghurt sauce or something else?